Alert! 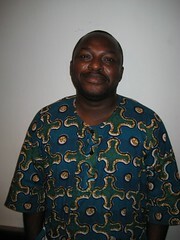 South African Mandla Langa and Nigerian Uwem Akpan have won the 2009 Commonwealth Writers’ Prizes for the Africa region. Langa won the “Best Book” category for his novel, The Lost Colours of the Chameleon, published by Pan Macmillan and Akpan the “Best First Book” category for his book of short stories, Say You’re One of Them, published by Abacus. The winners were announced at Durban’s Time of the Writer this evening. Akpan’s book was previously shortlisted for the Caine Prize, and beat no fewer than five South African rivals to the Best First Book gong. Langa’s novel rose to the top of an SA-only shortlist. (Click here for the complete 2009 CWP shortlists.) Both he and Langa receive £1 000, and go on to compete with with other regional winners for the overall Best Book and Best First Book prizes, worth £10 000 and £5 000 respectively. August this year has become a very important month for the people of Bangula. There is expectation that President Abioseh Gondo, who was actually born in August, will not survive the inquiry. Rumour has it that Zebulon, in league with the Provisional Authority for Progress, has already tasked the carpenters to construct a gallows. Not waiting for the rumour to be confirmed, people are fleeing the island in droves. Mr Hieronymus Jerome remembers the day of his own flight. it was in August, almost a lifetime ago, when he was just ten years old. In the sugarcane field that day, he felt the rise of the wind and the snap of the tall grass against his shins. His anger came in waves of nausea and then subsided. Congratulations to both authors and good luck in the next round! An outstanding achievement, congratulations -- what a wonderful first piece of news for the day, it's so nice to wake up to good news about positive events. Brilliant news - did a review of 'Lost Colours of the Chameleon' for Words Etc. Great stuff. Inspiring news,indeed. Hats off to both! My congratulations suffered comment death, and serve me right -- I was still suffering a pang for Magona and Bennett. But these are wonderfully worthy winners amidst a glorious clutch of books. Felicitations! Congratulations to Mandla Langa. BookSA represent! Congratulations, that's wonderful news. Just the incitement I need to finally get round to reading Lost Colours, which I've been meaning to for ages. Huge congratulations! Both those excerpts sound really great and I'm now inspired to read Lost Colours of the Chameleon. Well done, Mandla, for flying the SA flag high. My best wishes to you both! A stunning achievement!